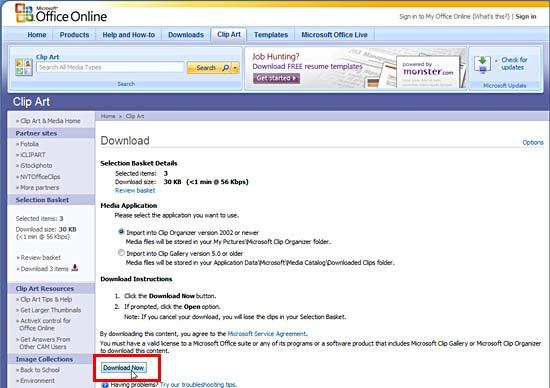 Learn how to download a map from Microsoft's Office.com, and then ungroup it in PowerPoint 2007 and 2010. Update on October 4, 2011: We highly recommend you just go and download the readymade US map we provide because Microsoft has changed the way clip media can be downloaded from Office.com -- in addition, they no longer seem to have any ungroupable US maps available now. 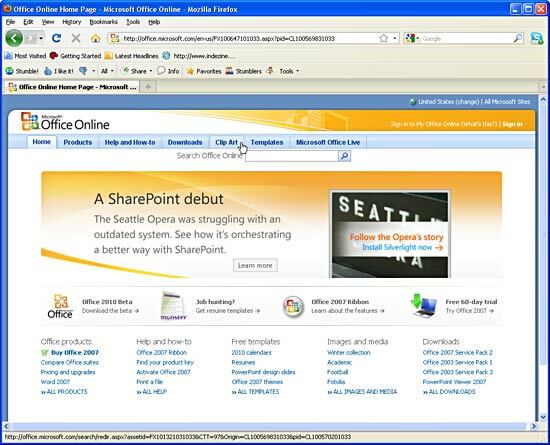 Launch the Microsoft Office site in your browser, as shown in Figure 1 below. 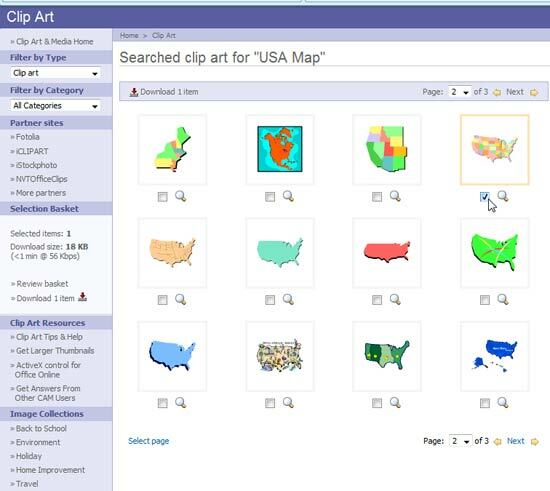 Within the Clip Art tab, enter the keyword (USA Map) in the search box, and click the downward arrow button next to search button to choose "Clip art", as shown in Figure 2. 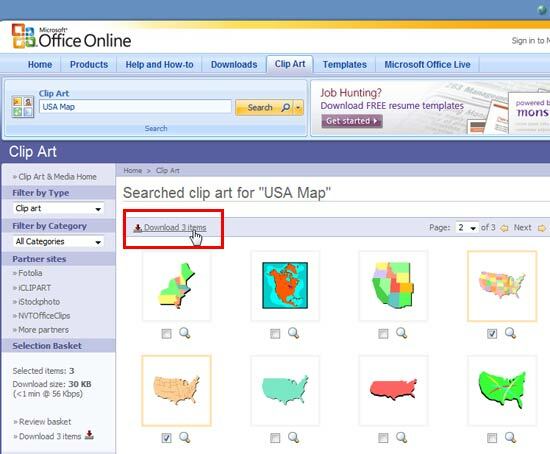 Tip: Searching within just the Clip Art type enables you to mainly get vector files that can be ungrouped in PowerPoint. Based on the keyword and the type of file, you'll get the search result in the next page that you can see in Figure 3. Look for maps that have state outlines visible. From the search result select an appropriate WMF or EMF file (place your cursor over the thumbnail and you'll know if it is a WMF or EMF file -- avoid JPEG, PNG, or GIF files in this case). You can click the box under the thumbnail to select it for subsequent download. Figure 3 shows how I selected one of the files to download (mp00224_.wmf). You can select as many files as you want. When done, click the Download option (highlighted in red) as shown in Figure 4. Note: If you are downloading for the first time from the Office.com site, you might get an Agreement page that makes you click an Accept button to proceed. This opens the Download page (see Figure 5) -- here you get the details such as download size, download time, etc. Just click the Download Now button (highlighted in red) to start the download process. 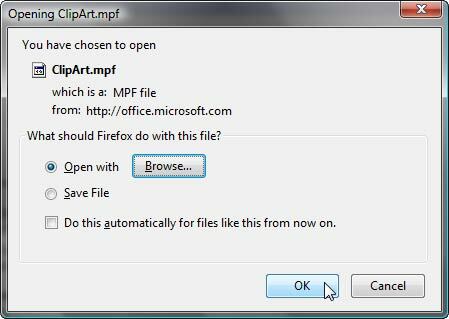 Clicking the Download Now button in the preceding step opens your browsers Save dialog box as shown in Figure 6. Your browser may show a different dialog box -- just look out for an opening option -- and then choose as required. 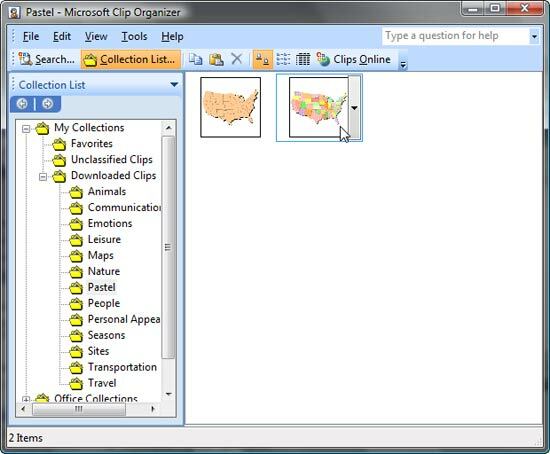 If you choose the Open option, this will typically launch the Microsoft Clip Organizer (see Figure 7) with the downloaded files.